A new disc from The Wallace Collection on Nimbus Records, exploring Sir Peter Maxwell Davies’ rich and varied writing for brass instruments. This collection brings with it some fascinating contrasts. On the one hand is the substantial Brass Quintet, a large-scale piece the composer wrote for the Empire Brass Quintet in 1981. It leaves a lasting impression, especially in the second of the three movements – an Adagio 16 minutes in length. It explores some desolate sound pictures, the composer achieving a strikingly dark and often subdued backdrop akin to the sky of the Lowry painting on the cover of the release. Yet like that picture (Yachts, from 1959) there are pinpricks of light, too, as Maxwell Davies brings the instruments out in a solo capacity – especially the horn and two trumpets. It is a pointer towards the two complementary solo works on the disc. Litany for a Ruined Chapel between Sleep and Shore is for trumpet, and was written about the medieval ruins on the Orkney island of Sanday, where the composer moved in 1999. Sea Eagle, for solo horn, is a musical observation of a creature that captivated the composer from his first Orkney home in 1982. Shorter works for brass complete the program, with a ceremonial fanfare written for the opening of The Lowry arts centre in Manchester, and arrangements of four short pieces by Tallis that reveal his influence on Maxwell Davies as a composer. Yes – but the music of Maxwell Davies, especially in the Brass Quintet, requires some work on the part of the listener to realise its full potential. It has taken me a long time to appreciate the composer’s music, as it can be difficult to connect with emotionally, and there are some complex harmonies. Yet familiarity brings great reward, and the bold writing for brass on such a large scale can be appreciated – especially when the music is quiet. The Wallace Collection are superb in the quintet, their feats of stamina and virtuosity complemented by genuine strength of feeling. The works for solo instruments are more immediate in their impact, and helped by performances that could not be bettered. John Wallace plays as the composer would wish in the Litany, evoking an outdoor scene in the middle of the ruined Orkney church. Meanwhile Sea Eagle is still more effective, a vivid picture of the magnificent bird and the ultimate freedom it finds on the wing. With an especially reverberant recording in St Marylebone Church Paul Gardham delivers an outstanding performance. The other pieces are well positioned on the disc and lighten the mood – the Four Voluntaries especially poignant in the simplicity of their arrangement. Yes. This disc is a fine achievement documenting not just one of our greatest living composers but celebrating his habitat too. A nicely balanced hour of chamber music, with one classic of the piano trio repertoire complemented by a very little-known work. That said, the music of York Bowen has received a lot of exposure of late – too much, some would say! At its best though Bowen’s writing shows that his high regard from composers such as Camille Saint-Saëns was not misplaced. It is chamber music that seems to be the most consistent part of his output. This Rhapsody Trio – written in a single movement format popular with English composers in the early decades of the twentieth century – was premiered at the Savoy Hotel early in 1926 at the annual dinner of the Federation of British Music Industries. Schubert’s two big works for piano trio are justly celebrated, being two of the best and most substantial pieces for the form. The first was written a year before the composer’s death, for the same trio that gave the first performance of Beethoven’s Archduke piano trio. Incidentally that work is set in the same key, B flat major, leading to the drawing of similarities between the two. The works are similar length, but Schubert imposes his own distinctive style here, writing music that seems on the face of it to be very optimistic – but which can on closer inspection have a few worrisome moments. There is no shortage of tunes, though, and in the slow movement especially Schubert brings his song-writing prowess to bear in some beautifully written duet work for violin and cello above the piano. Watching this performance from The Gould Trio it was immediately clear just how much enjoyment they took from the music. The Schubert was full of sleights of humour but was also very detailed, and pianist Benjamin Frith demonstrated an uncanny instinct for knowing when to hold back slightly in a phrase, or when to push on. The first movement emphasised how gracefully Schubert writes for strings, even in the midst of a lot of bluster, while the song-based second movement lived up to its billing. The ‘Scherzo’ was witty and took time over the longer notes of his contrasting ‘trio’ section, while as the curious last movement wended its way through all sorts of different keys the trio always had a firm hand on the tiller. Meanwhile the Bowen was given the conviction and passion his music needs, emerging as a really fine piece of music. The end in particular was extremely well done, thoughtful but holding the audience in the palm of its hand. 2:23 – the music begins as though emerging from a dream into the morning light. Held notes from the strings and some lazy thoughts from the piano are initially quite unfocused, but gradually the trio find their footing and a bold, louder passage ensues. At 4:34 a fetching melody can be heard on violin and cello in unison. The music gradually picks up speed, the instruments now a lot more independent and the piano part more demanding. Although the comparisons are often between Bowen and Rachmaninov, I find the appealing unison passage from 9:30 to be like Fauré. After another passionate section the music seems to be spent, but Bowen brings out a really atmospheric and rather affecting ending from around 14:00 onwards, all three instruments seemingly lost in thought. 17:55 – Few chamber works begin with this much positivity! Here the Gould Piano Trio are at pains to stress this music can also be graceful – a lot of trios give the opening of the first movement too much oomph. Here though the tune shines through, and is nicely articulated by pianist Benjamin Frith at 18:49. 19:49 – Schubert’s light and songful second main tune appears on the cello. The trio repeat the first section of this movement at 21:49. 25:35 – Schubert now takes the music further from home, moving through a number of different keys as the main tune gets distorted and more worked up. Eventually this leads back to ‘home’, and the main tune in its original state, at 29:01, from the piano with soft accompaniment. Then at around 31:40 the music pulls back, leading through to an emphatic finish at 32:46. 42:55 – the third movement begins. This is a ‘Scherzo’ (normally a jokey kind of movement) and it begins here with an innocent sounding melody. Then Schubert develops a kind of melodic cell that gets passed between the three instruments. 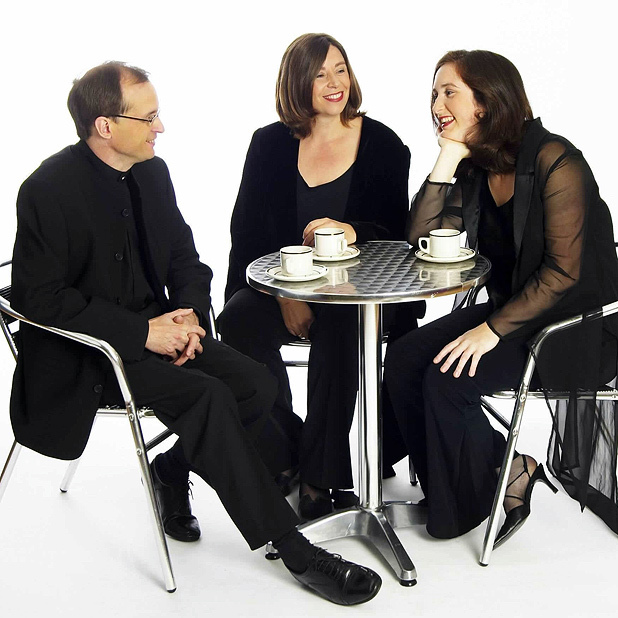 The humour – exploited by The Gould Trio – comes mostly in the stop-start nature of the music. The trio section – usually a contrast – begins at 46:14 and is graceful, with long notes in the strings. The scherzo section returns at 48:05. 50:09 – the last movement begins with a sweet tune from the violin, then moves onto a more obviously dance-based second tune (50:49) Schubert then takes the music on a tour of some pretty distant tonal centres, setting his tunes in increasingly playful formats but keeping in the spirit of the dance. Then as the end approaches Schubert keeps pretending to finish before moving off in contrary directions…until he finally does at 59:02, setting off on a quick coda.